I have been sharing a lot of my favorite books to use in the elementary music classroom, particularly with the younger grades recently- you can read this post for ideas for Bear Snores On, and this post for We're Going On a Bear Hunt- but today's book is my all-time favorite lesson using a book in music class, period. I actually teach the students the song before reading the story, and as I read, I have the students sing along with the song while keeping a steady beat on their legs. When I read, I intentionally read things a certain way to reinforce high and low later on: 1) every time someone goes up or down the stairs, I make the pitch of my voice go gradually higher or lower (on the words, "thump, thump...") and 2) I vary the pitch of each character's speaking voice (the lowest is the police, dad is next, then mom, and the siblings are the highest). Once they have heard the story and know the song, I assign the students to a character. It doesn't matter how many you have of each at this point- I usually split them up equally between police, dad, mom, and siblings. On their character's portion, those students say the "thump, thump" going up and down the stairs, with their voices going higher and lower, and they also say "Mortimer, be quiet!" in their best impression of that character (I don't worry if they are using the same pitches as I do for that). I also still have them all sing the song each time. Once the students are able to perform their character's part, including making their voices go up and down correctly (and I usually have them switch parts a few times), we move to xylophones! The first thing we practice is singing while playing a bordun on the tonic and dominant notes (which they have already been practicing by patting the beat on their legs). Then we all practice going up and down the stairs together- we start at the lowest note and "walk" up by alternating hands and then go back down the other direction. We also practice running up the stairs (which I have the siblings do) by doing a gliss (sliding the mallet across the bars) in each direction. We practice going the correct direction by hearing my call out "up the stairs" or "down the stairs", in random order, and practicing starting on the low or high note. The final step is to perform the whole story with instruments! There are 2 more things that students need to practice to do the final version: adding a few unpitched percussion parts, and splitting up the characters again. I assign the characters by the barred instrument type (hence the variation in pitch in the initial reading): bass instruments are the police, altos are the dad, sopranos are the mom, and glockenspiels are the siblings. 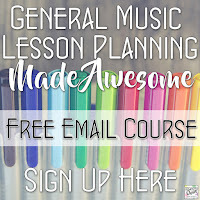 If you don't have all of the different types, you can still assign different parts to different students- it is just an added layer of learning to distinguish between instrument types if you do have them. Keep 3 students aside with no barred instruments (I tend to pick the ones who need the least amount of further practice on high/low on the xylophones) while you make sure each student knows when to play their parts for going up and down the stairs and say their line ("be quiet!"). I use 3 unpitched percussion instruments to add another layer of interest and fun to the story. These are totally not necessary for teaching high/low or xylophone technique, but a) it makes the story more fun, b) it gives a chance to give some students a "special part", and c) I take the opportunity to introduce all of the students to these "color instruments" to get them started on knowing the names and how to play them. I have one student who is the opening door, performed on the ratchet, one student who is the closing door, performed on the slap stick, and another who is Mortimer's nodding head, performed on the vibraslap. Obviously you could use other instruments you have in your classroom as well. At the end of the story, I have all 3 of those students lie down on the floor and pretend to go to sleep (it gives them something to do at the end of the story when their parts stop, and I don't want the students on xylophones falling on the floor and knocking the bars off of their instruments). My students and I love this lesson! I always videotape their final performance and show it to their homeroom teachers. I've also used it to do an "informance" in class and invite parents, teachers, and staff to come and watch informally in the classroom, and that was a big hit as well. 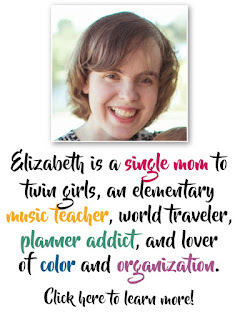 And after doing it one year, I come back to it again and again for the next few years to review high and low on the Orff instruments (they don't mind). 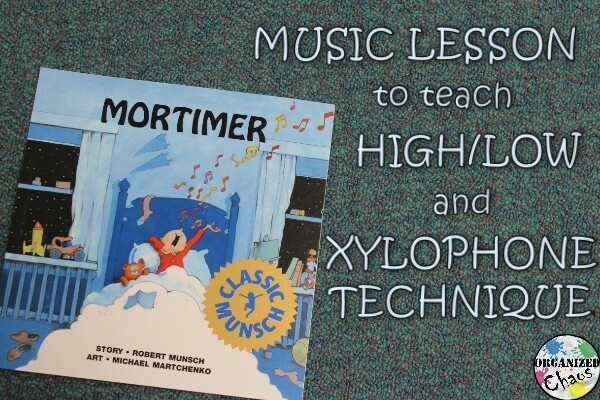 What are your favorite books to use in the music classroom? Share your ideas in the comments below- I'd love to hear them! What grade levels do you start this with? I have done it with both kindergarten and 1st grade, but I think it is best for 1st grade. Kindergarten can do it but it takes more time to practice everything. This is a fantastic blog post about weaving literacy, music and relevant life experience in a music lesson. I love it and plan on using some of your ideas in my lessons. Thank you for sharing this post. LOVE this book! I use the exact same "color" instruments when I do this book! Great idea using the natural pitches of different groups of instruments to represent the voices! I'm adding that the next time I do this lesson! Thanks! I love this lesson so much! :) Thanks for commenting, I'm glad you found something new to add! Do you have a copy of the song you use with this book? Do you think it would be possible to incorporate unpitched percussion instruments in ostinatos to accompany the story as well? I actually just meant during the song portion.